Mark’s birthday is today! Happy birthday! This is what I made for him for his birthday three years ago. He knew what I was doing, because I had to get the shirts from him, but he didn’t get to see how I put them together until his big day. 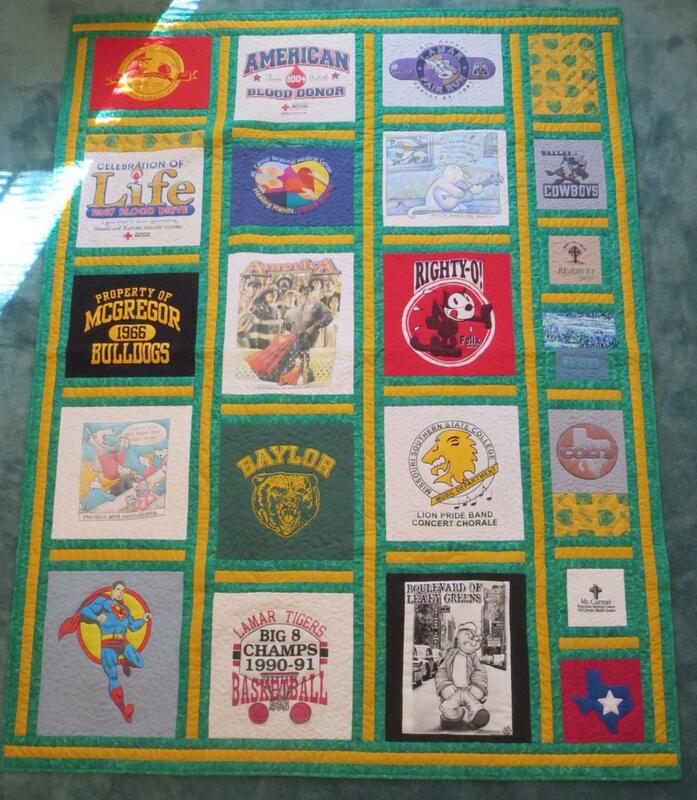 Included are shirts from his high school, his sons’ schools, items from his professional work, and, of course, Texas! I cut the shirts apart, then backed the parts I wanted to use with a lightweight fusible interfacing. Because I didn’t want huge empty, solid areas around the smaller designs, I cut the blocks into a variety of sizes. The right side column is made of smaller motifs, some special fabrics, and a machine-embroidered Texas. 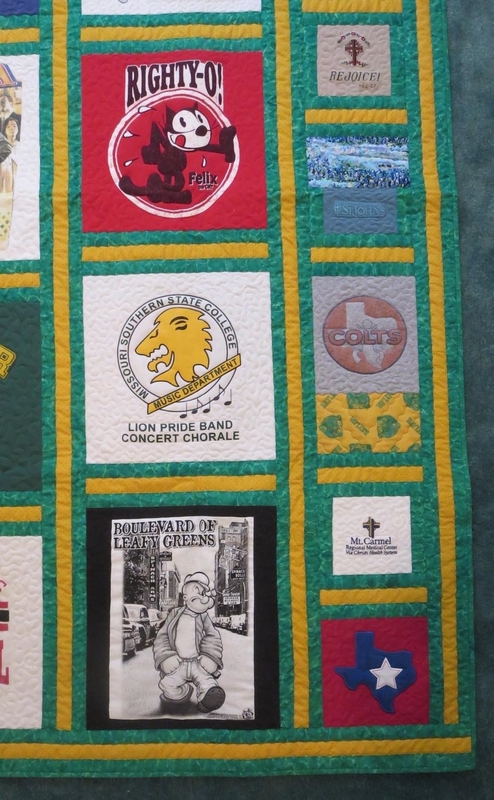 It was all put together with yellow and green (Baylor colors!) sashing. The back is fun, too. 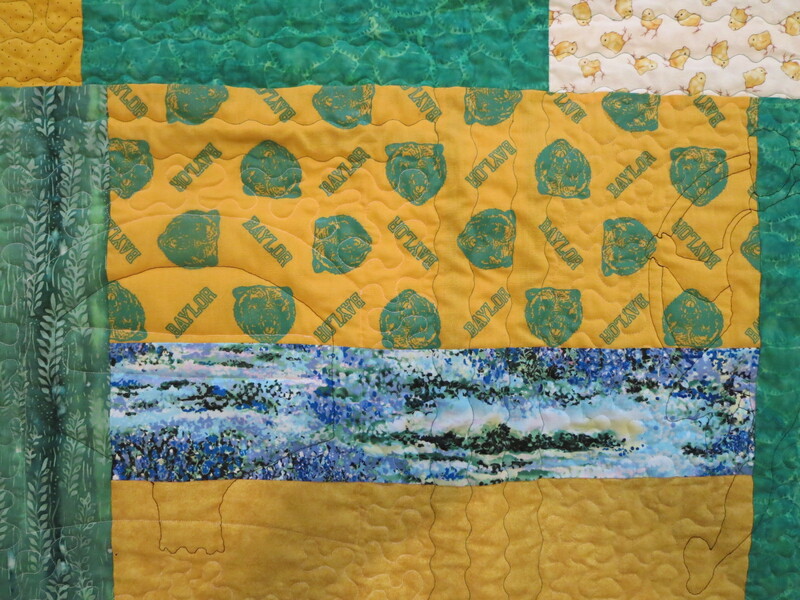 Instead of using a single fabric for the backing, I pulled yellow and green fabrics from my stash, cut them into big blocks, and patchworked them together. This is something you could do for any quilt, but it’s especially nice for a lap quilt or snuggle quilt, in which the back will frequently be seen. The blue fabric is Texas State Flower fabric, left over from the wall hanging I made him years before. 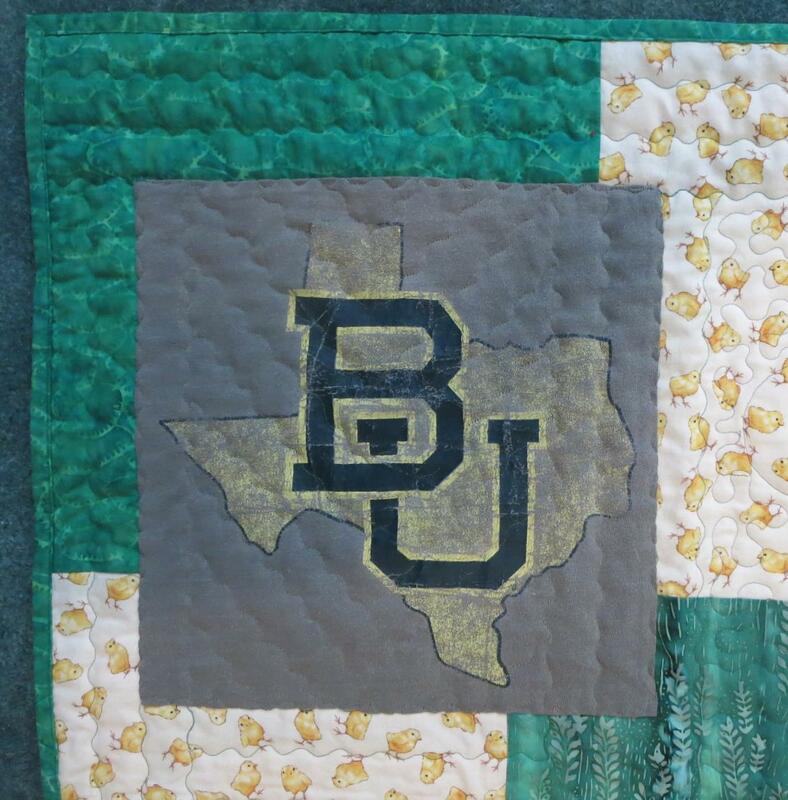 This Baylor print fabric is one of the strangest fabrics I’ve ever used! It was from – get this! – a pair of boxers he’d gotten back in his college days! I doubt that he ever wore them. The fabric was a very poor quality, poly/cotton-ish, and loosely woven. But the really weird part was that the green motifs were printed with this rubbery stuff! It was hard to quilt the areas where this fabric was on the back, because the rubbery stuff didn’t slide on the machine bed. 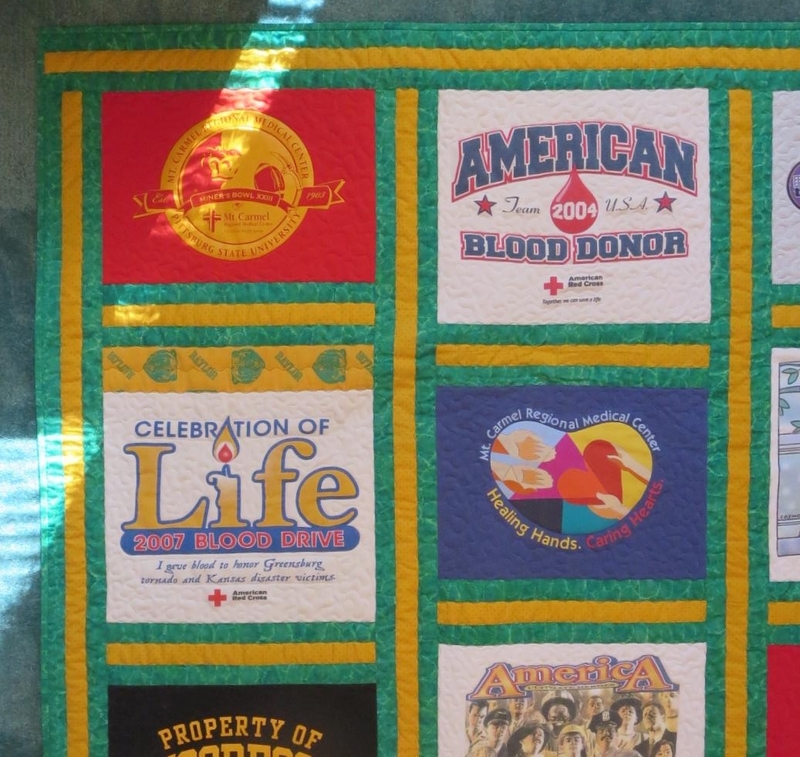 Fortunately, this was not a contest quilt! 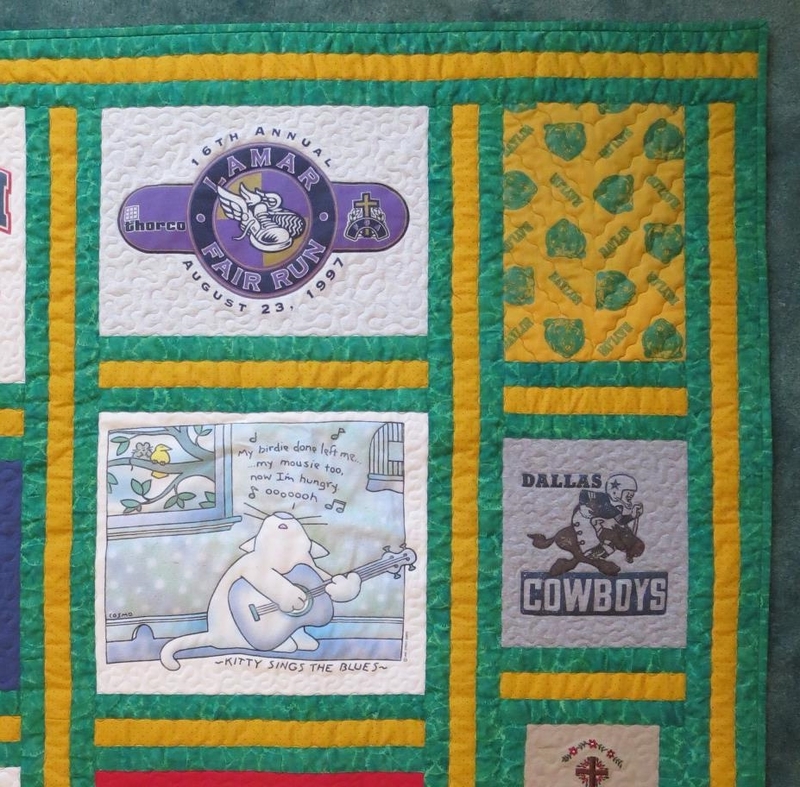 Quilting was simple and quick. I outline stitched the shirt motifs, did a free-motion wavy line instead of stitch-in-the-ditch of all the seams, and did a loose meander pretty much everywhere else. 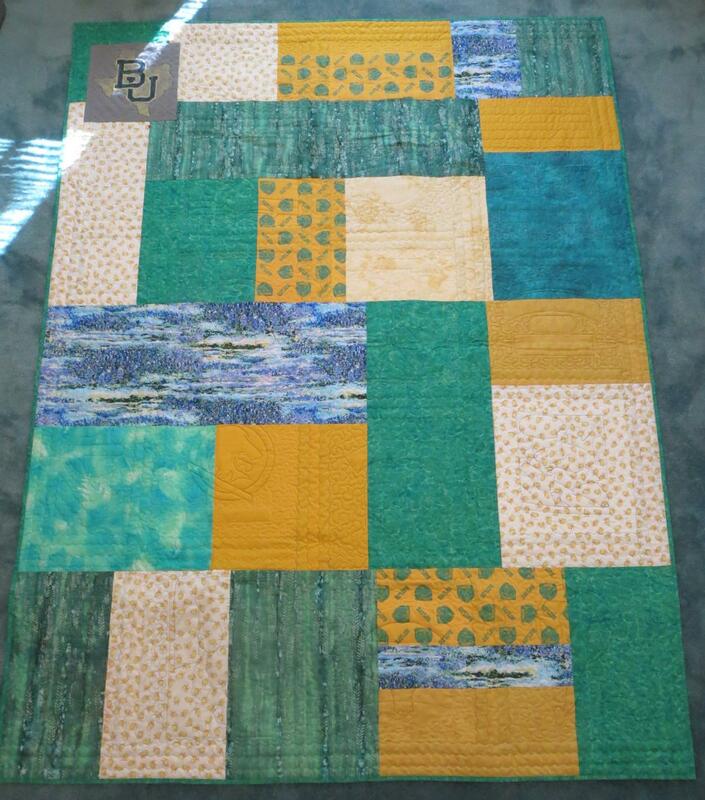 This quilt was meant to be used, and I wanted it to be soft, not heavily quilted. 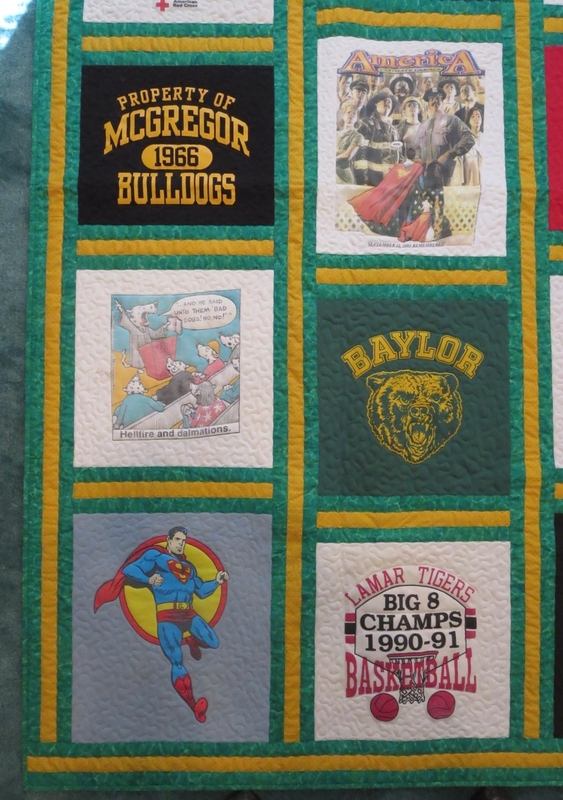 About a year ago, Mark had to retire one of his favorite shirts that he couldn’t bear to give up when I made the quilt. It was literally falling apart. So I cut it up, and appliqued it to the back. I re-quilted the quilting lines from the front, using monofilament in the needle so there wouldn’t be double threads, to secure the fabric to the back. I guess I can add lots more old shirts to the back as the years go by! 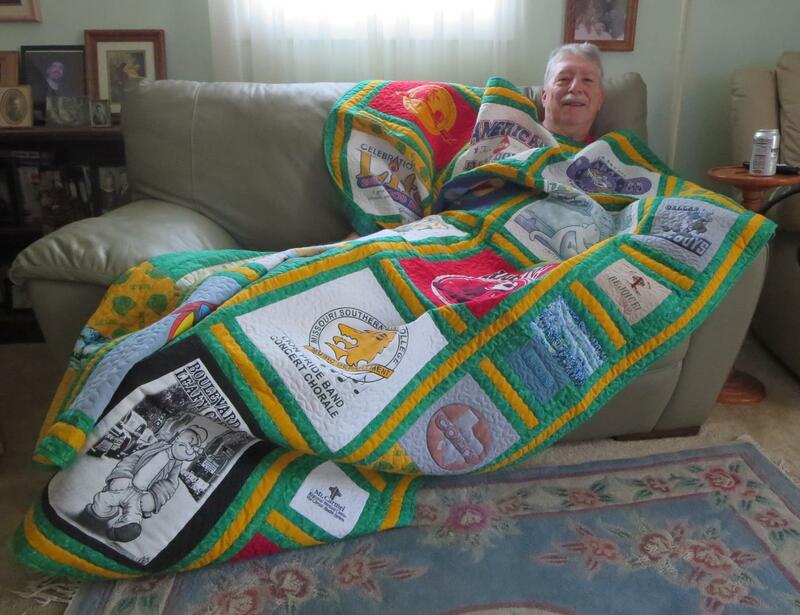 This entry was posted in Uncategorized and tagged Family, Quilts by susanstewartdesigns. Bookmark the permalink.